Owners are moving out of the state and want to focus their time on their move so they have reduced the sales price by $21,000 and are open to all reasonable offers. Great opportunity for expansion of your existing concept or a family run business. Currently absentee owner operating as a Chinese "quick serve" restaurant but owner states landlord is open to other concepts. Great street exposure and signage in a well maintained shopping center with two major anchor tenants as well as other well established businesses bring LOTS of traffic to the center. Easy in-out to center and restaurant with plenty of parking. Avoid the hassles of tenant improvements, build-out and permitting. No liquor or beer wine license transfer means you could get up and running quickly. Approximately 14' hood offers versatility for wide range of equipment. 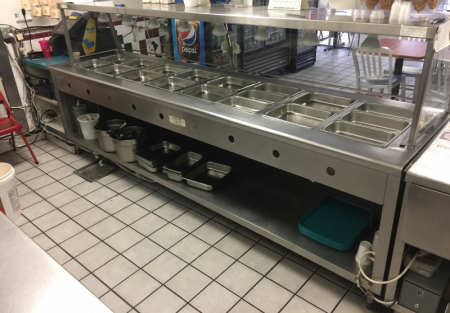 Currently has wok station, 4 burners and fryers. Other equipment includes name brand reach-in refrigerators and freezer. Go to sellingRestaurants.com to get the name and address of this listing. Search for listing 5414. Currently closes at 8:30 and all day Sunday. Expanded operating hours and owner presence could potentially increase bottom line SUBSTANTIALLY. No sales figures or books will be provided but owner states business is profitable. Owner moving out of state so bring all offers.